BioShock Collection contains the original game, BioShock 2 and BioShock Infinite, plus all single-player DLC and a new video series. 2K Games has officially announced the BioShock Collection for Xbox One, PS4 and PC. The bundle contains the original BioShock, BioShock 2 and BioShock Infinite, plus all single-player DLC and a never-before-seen video series called 'Director's Commentary: Imagining BioShock'. 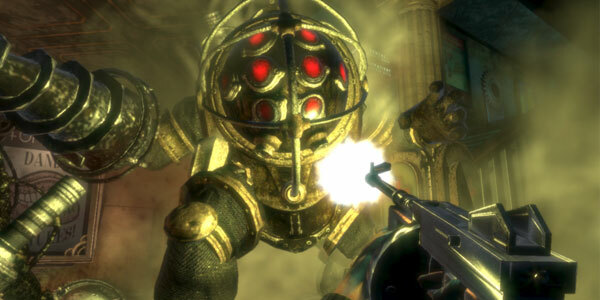 The original BioShock also contains a series of Challenge Rooms, which feature puzzles, Big Daddy battles, Achievements and more. BioShock 2 bonus content includes the Minerva's Den story expansion, as well as the Protector Trials DLC. Multiplayer DLC packs will not be included. As expected, BioShock infinite's Burial at Sea DLC also features in the package, as well as the Clash in the Clouds add-on and the Columbia's Finest pack. According to 2K, all of the weapons, plasmids, levels and character models have been reskinned to look better than ever, although the PC version has not been remastered because it already meets current-gen console standards. The BioShock Collection will be available on PC and consoles from September 16 in the UK and September 13 in North America.